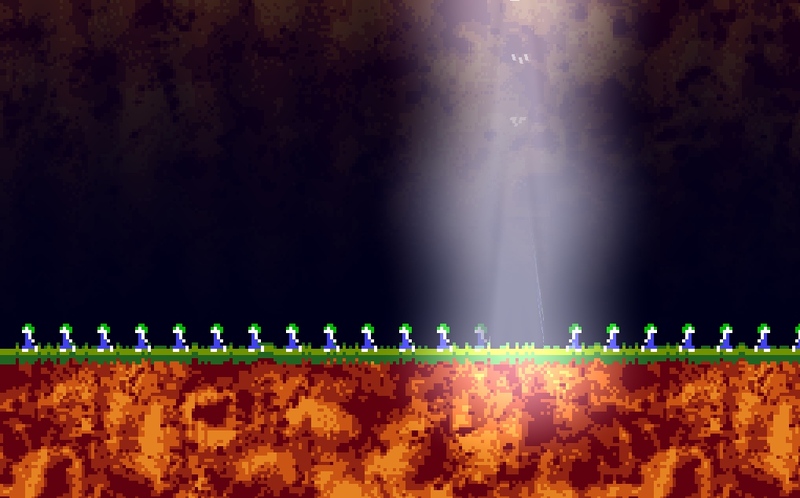 I started coding in 1997 and one of the first programs I made was a Lemmings clone in x86-Assembler (TASM). Since then I've made several variations and prototypes in C++, AS3 and Unity3D so there had to be a Shadertoy version too. I combined it with my procedural Space Invader generator shader and synced the walking animation to the music. 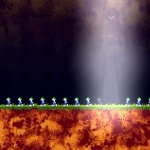 The Lemmings sprite animation is 6x10 pixels of size, has 4 colors and 8 frames; 1 frame is encoded into 5 numbers (integers); One number contains 12px (24bit); 2 bit per pixel. Click+drag your mouse to change landing zone and direction.